The Reizen RE-980L amplifier is easy to use and works with your choice of Reizen headsets to deliver precise levels of listening and talking comfort, superior protection, and excellent audio performance. The RE-980L boasts near-universal compatibility with single and multi-line telephones including PBX systems. With its ergonomically designed volume control, headset/handset selection button and mute control, the RE-980L combines power and affordability in a comfortable and lightweight telephone amplifier base which is so easy to install. This amplifier will not only amplify your incoming conversations, but it also allows you to amplify your outgoing speaking voice so that all your callers can hear you loud and clear. 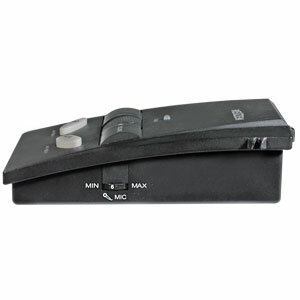 The RE-980L has a built-in control circuit for use with the Auto-Lift handset lifter (purchased seperately). This unit can be powered from mulitple sources. It can be operated with an A/C Adapter or with (2) AA batteries. The RE-980L is also equipped with an LED indicator and a 6-position selector switch. Comes with an attractive headset stand to be used to keep your headset cord tangle-free and easily accessible.